s one of the leading suppliers of hydraulic fixtures in the UK, Brown & Holmes (Tamworth) Ltd understands that quality and responsive customer service is key to success. As well as building fixtures to the highest quality specifications, the company also only use quality hydraulic components from suppliers such as Roemheld. 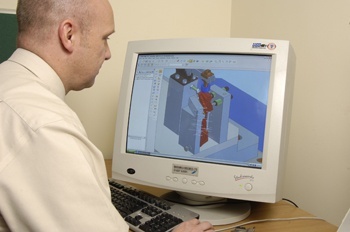 As a sub-contractor for three main machine tool builders in the UK, as well as supplying directly to a large number of customers, Brown & Holmes has earned a reputation for design excellence and building product to high accuracy. This extends right down to its careful choice of every single component specified. Since its management buyout in 2003, Brown & Holmes (Tamworth) Ltd has gone from strength to strength. Carl Baker and Kevin Ward, who now run the company, both started as apprentices back in the 1970’s with the original Brown & Holmes and they have spent the past three years rebuilding the business and setting up a new purpose built plant in Tamworth. Turnover in 2005 was £3 million and is expected to increase significantly in 2006 as Brown & Holmes is now also the exclusive UK agent for the Forkardt workholding range of precision chucks and mandrels. The company has built a reputation for specialising in precision workholding solutions. The company can manufacture a product to a customer’s specifications or using the expertise of an in-house team of designers, can design and manufacture bespoke fixtures and gauges and special purpose machines. The Roemheld 3D modelling package available on the Roemheld website and interactive CD-ROM has proved invaluable in assisting with planning these solutions as there is no need for the designers to spend time drawing in a component, it can just be downloaded in 3D format and incorporated into the 3D plan within seconds. The new base in Tamworth has allowed the company to expand its operations and its ongoing investment in machine tools is set to continue. With the UK market contracting slightly as manufacturing continues to move overseas to Europe, Brown & Holmes is currently looking to expand its export business that currently supplies to Ireland, Germany, Norway and The Czech Republic.